Night games after day games are nice, and typically provide a good 27 hours between pitches. Don’t get me wrong, I’m loving every minute of this being my “job”, but it’s nice to get a little bit of a break. Monday’s game I went with Dong Hoon Lee, and his girlfriend Chrismare (pronounced Chris-Marie). Dong was an exchange student from South Korea when I was a senior, and his host parents’ son was a good friend of mine. Dong became a good friend throughout my senior year, despite the fact that he was two years younger. After he spent a year in Fort Atkinson, he attended a school in California for his junior and senior years, and graduated in 2007. He returned to Wisconsin and attended UW-Whitewater, where one of his original host parents (Brian Borland) serves as the defensive coordinator for the currently two time defending National Champions in Division III Football. After a year at UWW, he returned to South Korea to serve the mandatory two years in military, and is now back at UWW working towards his degree. The video below was recorded in either late 2004 or early 2005. I had a class that required me to interview somebody, and one of the options was non-verbal messages. The second part was not part of the interview (we had found out that Dong was quite ticklish). We weren’t hazing or making fun of him, and I did use the video for the project, just not the extracurricular activities. At the 2:31 mark Dong gets back at Josh (Choshee), with his teeth. 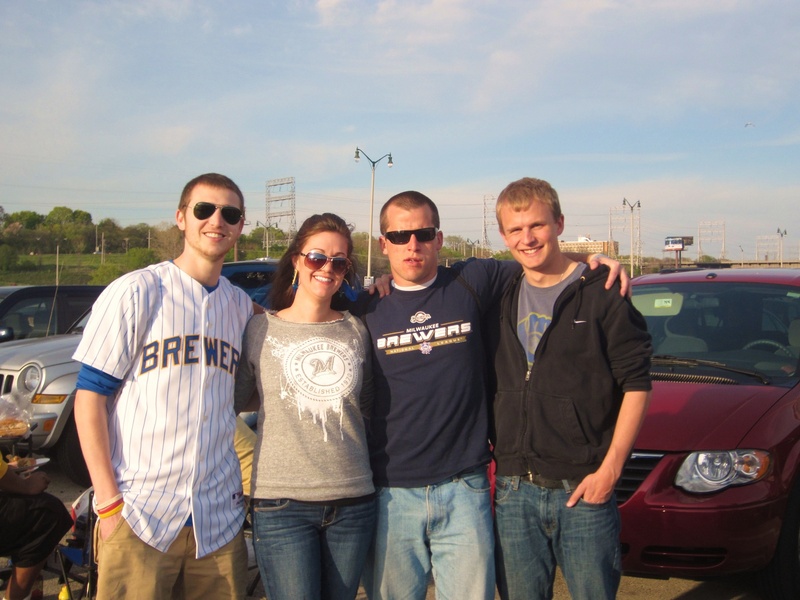 You might remember Josh from joining me at a few other games this year, and he’s pictured here, second from the right. Back to today. I met Dong and Chrismare (who is from South Africa) at the Pine Cone in Johnson Creek. 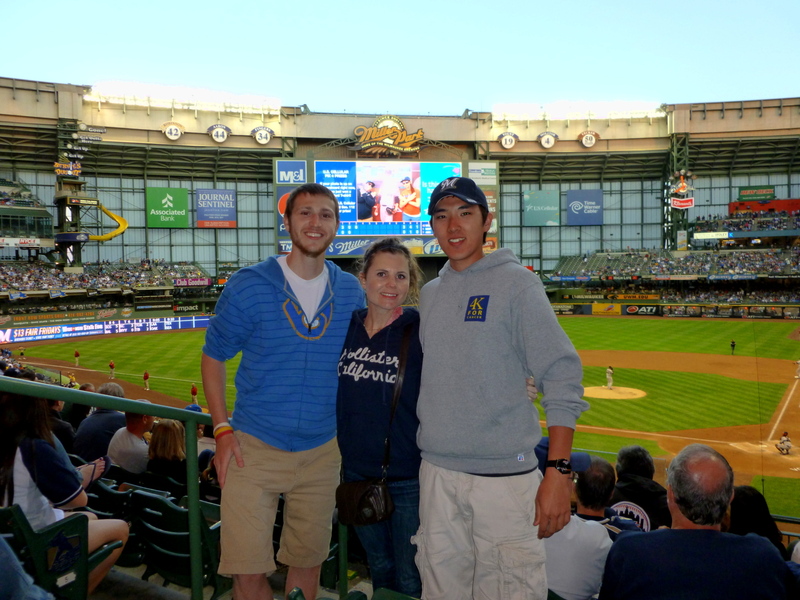 We drove to Milwaukee and caught up on what’s been going on and how the trip has been going. Dong and Chrismare are actually going to embark on a quest of their own starting on Sunday. They’re taking part in the 4K for cancer, the 4k doesn’t stand for four kilometers, but FOUR THOUSAND MILES! The event has been held annually since 2002 and the trip takes them from Baltimore to San Francisco over the course of about 70 days. Straight from 4kforcancer.org: “The 90 plus college students who cycle with us each summer embark on more than just a cross country bike ride; they also support our host communities by visiting cancer patients, taking part in community dinners, and giving cancer awareness presentations.” It’s a great cause and Dong was able to raise $4,550 for the ride, with most of that going to 4K For Cancer and their charities. We pulled into the Brewers 1 lot at 5:22, and I spent some time handing out business cards and trying to get people involved. I also did a live on-air interview with The Big 1070, which is one of Madison’s Sports Radio stations. I talked about what I’m doing and why, how it’s going so far, and that I was trying to auction off a great seat to Tuesday’s game. They repeated my twitter handle twice on air, but I’m guessing their audience is either not on twitter, or they just didn’t care about it, because I gained one follower after I was on the air (and zero bids). I was hoping to get more for the ticket than the $82.11 that I got, but anything is better than nothing. I’m grateful for Mark The Doorman who donated the tickets, and for Jeff, who had the winning bid. 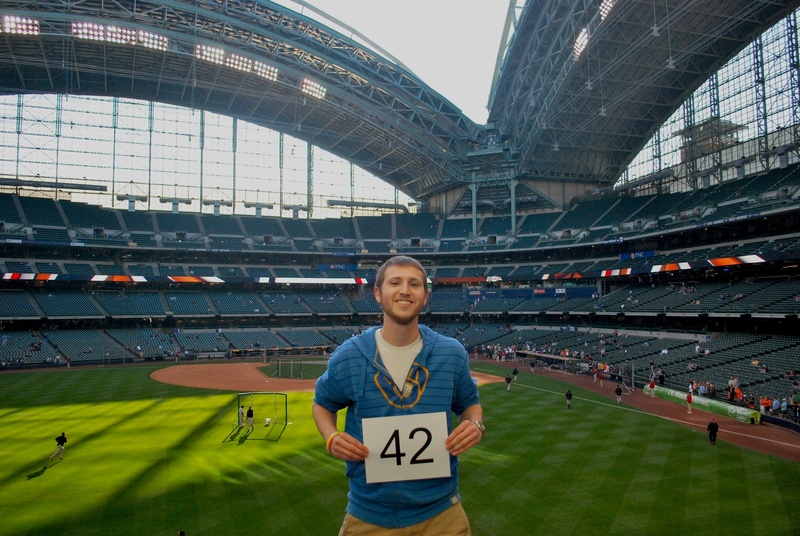 We got into Miller Park just after 6:00 pm, and went over to the left field corner of the loge level to get game photo number 42. Luckily the sun was hiding behind the closed roof panels, otherwise it would have been almost impossible to get a decent picture. Next month at the same time (6:10 pm) the sun will be blinding for people trying to track balls during batting practice, and it can be quite dangerous. We had a lot of time to kill before first pitch, so we walked around the concourse on the loge level. 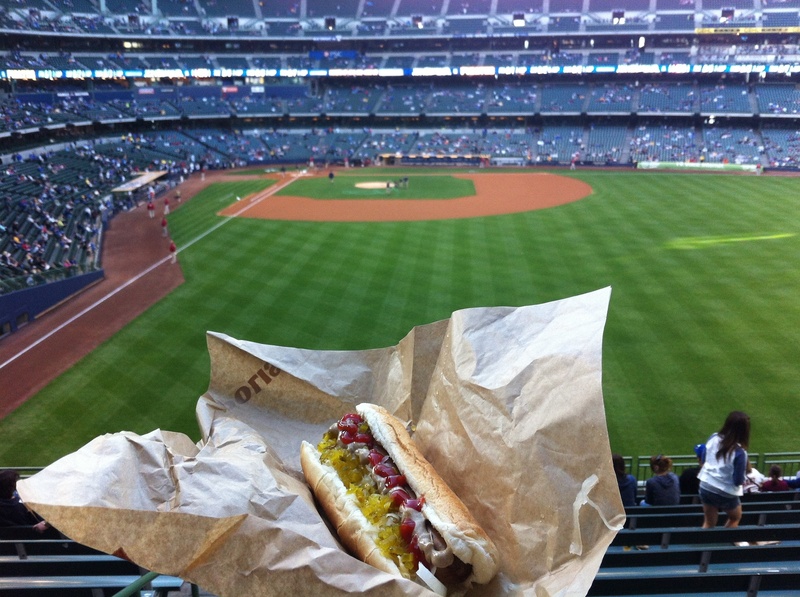 I bought one $1 hot dog near section 225, and we continued around to the right field corner, where we each purchased two $1 hot dogs. 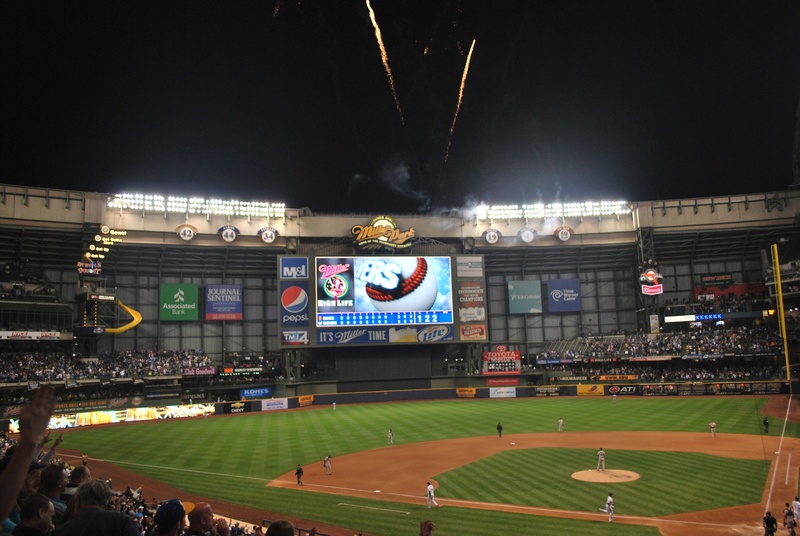 Monday-Wednesday is Spring Madness at Miller Park; $38 and cheaper seats are half price, and small hot dogs and kids sodas are $1 a piece. One of them posed nicely for a picture as we sat down to eat in the loge bleachers in right field. I put everything on my dogs; there’s ketchup, Koops brown mustard, onions, relish, and sauerkraut. The three of us made it to our seats and relaxed as we waited for the game to start. Chrismare had only been to baseball games in South Korea while visiting Dong, so this was her first MLB experience. She said she enjoyed herself, despite it being a somewhat boring game (on some people’s scorecards). As great as Sunday’s game had started for the Brewers, it was equally as bad on Tuesday. Randy Wolf walked two batters in the first inning, then gave up a 3-run home run to the Giant’s Buster Posey. The game remained 3-0 until the bottom of the sixth, when an RBI double by Aramaris Ramirez cut the lead to two runs. It was still 3-1 going into the bottom of the eighth, and Maysonet and Hart were out on strikes with a total of seven pitches between them. That’s when Norichika Aoki reached first on a fielding error by the Giant’s shortstop. The Giants manager left the starter (a lefty) in to face Braun, and Ryan made him pay. On a 1-2 pitch Braun cranked a massive game tying two run home run to left center, and it was a game again. The Brewers reported on the jumbotron that the ball traveled 459 feet, but I go to Hit Tracker Online for what I believe to be more accurate estimates (they claimed 437 feet for the home run). As Braun was halfway between third and home on his trot I pulled out my camera and got a picture, as the fireworks were still being fired, good stuff. After the eighth inning fireworks there wasn’t too much to get excited about. The game wound up going to the 14th inning, but the Brewers never really got themselves in a position to win the game. I believe only once did a baserunner reach 2nd base after Braun’s Home Run. The second pitch of the top of the 14th result in a solo home run off the bat of Hector Sanchez, and that concluded the scoring. Final Score: Giants 4 – Brewers 3. The two teams combined to strike out 30 times, and record only 14 hits (and 14 walks). Overall the two teams batted .144 (14/97), over the game’s fourteen innings. Lack of offense on both sides, I don’t mind it because it’s part of the game, but a lot of people left as the game went to extras and by the time the game was over there had to be about 5,000 people left of the announced crowd of 31,000. During the game I had a lady behind me take a picture of the three of us. From left to right it’s myself, Chrismare, and Dong. Now some unfortunate news; I’m almost positive my knee pain has been stemming from an MCL tear. At some point in the game, probably extras, I quickly got up to chase what I thought would be a nearby foul ball. An immediate sharp pain on the medial side of my left knew stopped me in my tracks. It was painful, but didn’t realize how painful until I tried to race up the steps to get another hot dog later in the game. I got about two steps before I realized I wasn’t going anywhere, and had to rely heavily on the railing to get bak to my seat. I read up on MCL injuries when I got home and they usually start with a small bruise on the medial part of the knee (what I had when it first started hurting). I’m thinking it was a grade one injury, but then all the miles that I’ve put on it and the quick movement yesterday made it more severe. Rest is the only real solution, so I’m not sure what’s going to happen. If you see me gimping around Miller Park trying to not bend my knee, you’ll know why. Don’t worry though, Dong went up and got us each another hot dog, making it four for each of us, and two for Chrismare. I’m leaving for the game in about three hours, and it should be another low scoring affair. Matt Cain (2.67 ERA) is pitching for the Giants and Shaun Marcum (3.31 ERA) for the Brewers.